Am I the Only Person in the World Who Doesn’t Want an iPhone? Forget the price tag (which is the primary reason why I won’t be buying an iPhone anytime soon), I’m not all that inspired to shell out any amount of cash for Apple’s latest hot gadget anytime soon. Why? I don’t need a fancy phone. I do need one that rings, takes voicemail, and allows me to text message my friends. My crappy Verizon flip phone isn’t really satisfying these needs either, but why spend $600 on a new iPod with phone capabilities? And the Google Maps feature… and the hours I’ve spent lost driving up and down the roads of Silicon Valley… almost has me reaching for my credit card en route to a bad Apple splurge. But I’m waiting for the next generation of iPhone. I look at the clunky first-gen iPods and I can only imagine how much better the iPhone will be in its next few incarnations. In other related news, I’m getting a (free) Blackberry for my new job. I’ve never owned a Blackberry, so I’m sure owning one will make me feel rather professional, as will my new (expensive) 30 minute train commute into the city. Anyway, speaking of Geezeo, I’m still patiently awaiting all of the features the site promises to eventually have. I’d love to have one spot to track all of my money, from checking account to my Vanguard investments. And what would be even better would be the ability to make widgets and graphs based on my spending to post in this blog. I’m not sure if that type of thing is in the works over at Geezeo, but it would sure get rid of the headache of attempting to manage my finances in multiple locations, including Excel – in order to make chart graphics. That’s not happening today, though, so off to Excel I go for a recount of June’s spending and income. I really don't want an iPhone. One of my friends has one, and it's really nice. However, I don't really think I need one. I'm perfectly content with my phone. If it got better reception/service, then yes, I would want one…but for all the little extras? I think I can do without…. I finally have an ipod, but I am very happy with my crappy cell phone. However when Apple starts producing the next generations of iphone and both my ipod and cell phone see inferior, it will be a lot easier to seperate this fool from his money. The reason I most want an iPhone? The ability to navigate through voicemail easily. I can do without the iPod features–I'd just like to be able to choose in what order to listen to my voicemail messags. I know I could skip over them on my current phone, but I'm much more of a visual person, and as such have never really bothered to learn to use the navigation buttons on my current phone's/provider's voicemail. 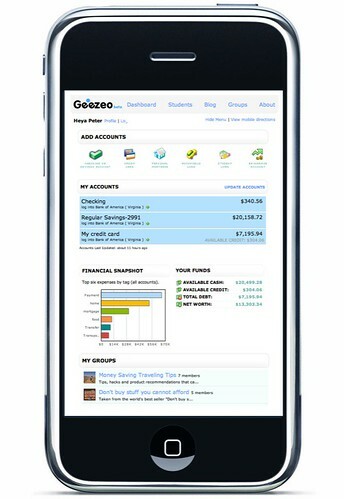 Love the Geezeo iPhone 😉 Brokerage is coming soon along with some other cool brokerage stuff. Widgets too…we'll be rolling out widgets so you can share your net worth, goals with live progress feeds and Geezeo Group widgets that will allow you to bring content directly into your blog. We just launched smart tagging this week and every week will be more exciting then the last! -Pete, Geezeo co-founderHappy 4th of July!